O.C.Tanner, the world’s number one rewards and recognition company, focuses on creating great work place cultures and enabling people to achieve and influence greatness. In order to propagate ‘Influencing greatness’, O.C.Tanner launched, Influence Greatness – a first-of-its-kind corporate web series, which aimed to capture ability of people who embody Greatness or Influence Greatness in others. In a 10-part series, stories of 10 such leaders and influencers from different walks of life, was presented. Stories of wisdom, power care and greatness from inspiring leaders, all of whom have made resonating impact, both in their careers and personal lives. 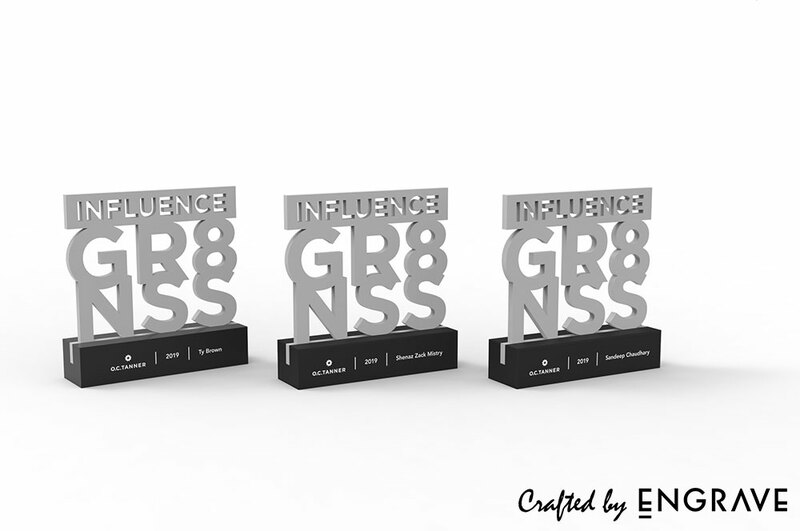 If you’re looking to organise a conference or symposium or the like, you may want us to do what we did for Influence Greatness.They asked Engrave Awards & More to conceptualise and execute trophies for the inspiring leaders part of this series. Needless to say, they wanted it to look elegant, sophisticated, and worth showcasing. They wanted us to use their event logo "INFLUENCE GR8 NSS " as the basis of our design. The material we chose to fabricate the trophy with was high quality acrylic. And what we came up with was elegant, classy, and striking. Oh, and we did all this in double quick time, well within deadline. You are invited to take a look at our handiwork in the images attached.